STAR WARS AFICIONADO WEBSITE: 'STAR WARS' AT 40: PREPARING THE CELEBRATIONS! 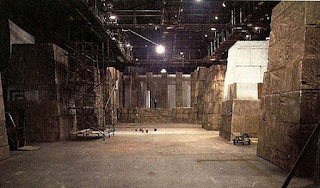 The Throne Room set details and 200 costume extras get organised for the finale filming at Shepperton Studios. Still early on in the shooting of The Star Wars, and the crowd/extras-heavy end medal ceremony is filmed at Shepperton Sudios, making the most of one of the country's then biggest soundstages to create the Massassi Temple Throne Room on Yavin IV, as our brave heroes are honoured by Princess Leia Organa and her generals on a raised dais at the end of the chamber. 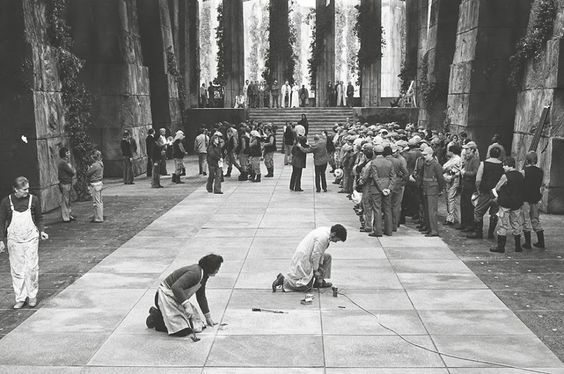 The massive set under construction. Terrific angle of the walk to the dais. Note Gary Kurtz taking stills. In the original late 1975 script, an injured but still alive Ben Kenobi would accompany the heroes, as would Threepio, but this was altered by the production's filming point in 1976 (though a painting by Ralph McQuarrie would prior show this scene). By then, Lucas had raised the drama stakes to kill the old Jedi off, whilst it was much more practical to have Anthony Daniels in the Threepio costume with the Princess than have him the actor inside him do lots of walking in the restrictive and painful to wear costume, and climb steps to a dais built nearly thirty feet off the studio floor. This practical reasoning would also apply to Kenny Baker inside the heavy Artoo shell.